During the year of 2018, what began as a small flicker of free-time fun for many across the globe will turn into a burning obsession, finding the best hobby drones is something that is important to many people. This great article here from the UK’s Guardian online version tells a little bit about the background and rise of these hobbyists that will no doubt be crowding the parks and some streets of your city soon. 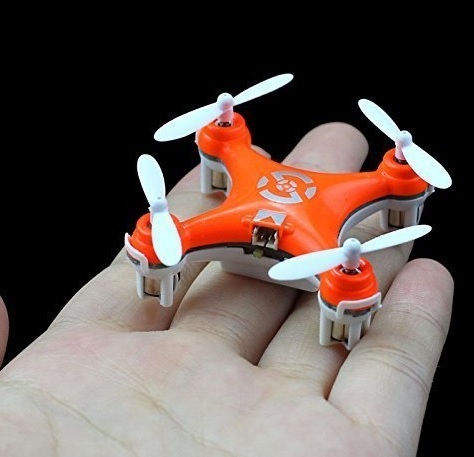 It seems (not surprisingly) that many who are now interested in finding the best hobby drones out there began flying with the tiny indoor helicopters, some even so primitive that they were attached by a cord to the controller. 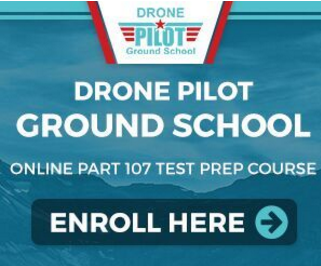 Very serious commercial drone pilots grew from 200 licenses held during 2014 to over 1,200 as of fall 2015, and some think that the consumer market has reached its peak. If something this futuristic, appealing to free spirits, and with the ability to go nearly anywhere is so exciting, why would some people think that the market has peaked before it has even got started? The reason why is that those who fall in the category just under the serious hobbyist simply may have no idea how difficult it is to pilot these gadgets. And if your first run is out of the gate on a day with a little wind, you may have no idea how much you really bargained for! We all know that there was some firmware updates to certain models to not go over places such as the nation’s capital in DC, but isn’t much of the rest of the planet pretty much considered open season? One reason why hobbyists love drones so much is that getting videos of areas that you have not yet explored is simply awesome. Whether it’s a location such as a beach, jungle, abandoned dump, or green meadows, once they get the video on their hard drive or feed, they can enjoy it again and again. This is probably what the real appeal is out there fueling the excitement: Just a decade or so ago there really weren’t many options for drones that really had a full 360 degree spectrum of control, let alone that had the ability to capture video from the flight. Even after some scares like this, hobbyists know that registering the drones is of importance this year, and are ready to hit the skies! Here are 4 of the best models that will be moving off the shelves, and some unique features about each one. Shop on Amazon.com for the Tomahawk, or get fast and free shipping from the >Altair Aerial Website. If you’re a photographer or just love taking pictures as a hobby, the Tomahawk by Altair Aerial is the definite right choice for you. At this time of writing, it’ll only cost you around $200, a more than reasonable price for everything it offers. You can choose to use the C5000 720p HD WiFi camera or use the action camera mount to bring a GoPro Hero 5 or Hero 6 onboard. Unlike most of the other Altair Aerial drones, the Tomahawk is able to withstand winds of between 10 to 13 miles per hour. The Tomahawk comes with a powerful version of Altitude Hold, leaving out any other extensive features that can complicate flying it. This just goes to show that it’s perfect for beginners, intermediates, experts, and even kids. It has a maximum flight time of between 15 to 17 minutes, able to go between 300 to 500 meters away, and uses the Bugs GO application. One of the best things about the Tomahawk is the fact that it has 8 GB of onboard storage all ready to go. This means, unless you want to use one, you don’t need to bring a TF flash card with you to store your footage. 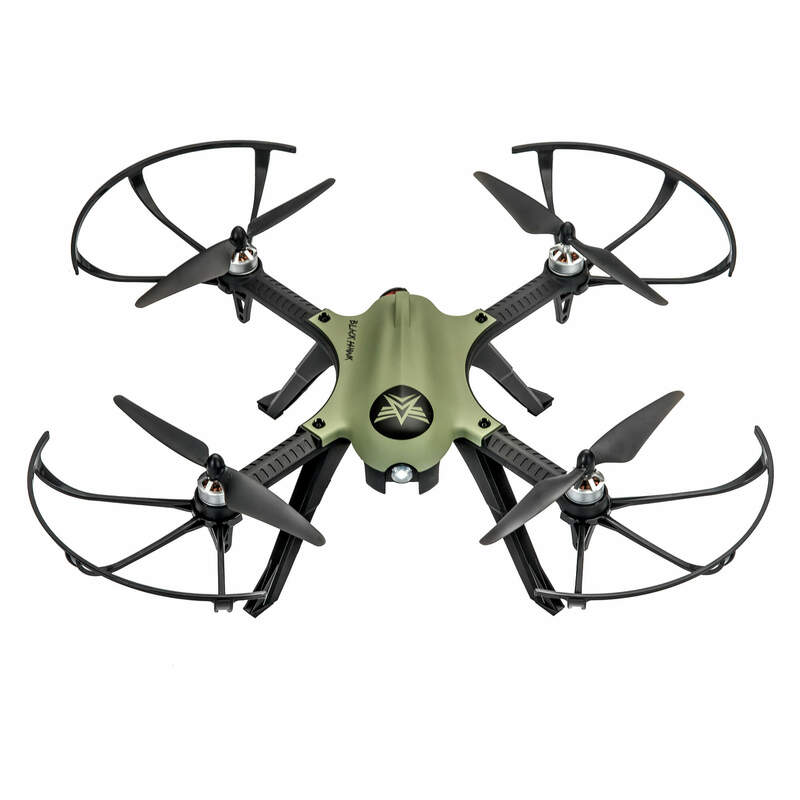 The 818 Plus is a nominally upgraded version of the AA108, keeping many of the features that made that drone our top choice for hobbyists. The three difficulty settings make it great for beginners and advanced fliers alike, the Headless mode makes it very easy to fly, and the altitude hold mode is great for getting the perfect photography or videography shot. This drone is also designed to have a slightly more stable and durable shape – you’ll note the improved landing gear and larger prop guards in the picture. 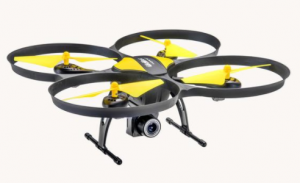 This drone is designed for hobbyists who also have an interest in the field of aerial photography, as the 150 meter flight range also demonstrates. Not only can it fly farther away from the remote, it can stream from farther, too – displaying FPV video on your phone from up to 60 meters. Whether or not these improvements are worth the cost hike from the AA108 are up to you, but if you’re looking for a good alternative to our number 1 hobby drone, the 818 Plus is an excellent choice. We’ve written about this drone before, but it still bears repeating: the Altair Aerial AA108 is simply the best all-ages drone for the money (which is a very reasonable $128.) It’s designed primary for beginners with a consistent hover pattern, a very durable design, and a wide suite of features that make it very easy for anyone to control. These include Heading Hold Mode (Headless Mode to the rest of us) and low speed setting specifically designed for first-time fliers. But what makes the AA108 really special is that it caters to all users, even those on the more advanced end of the hobbyist spectrum. 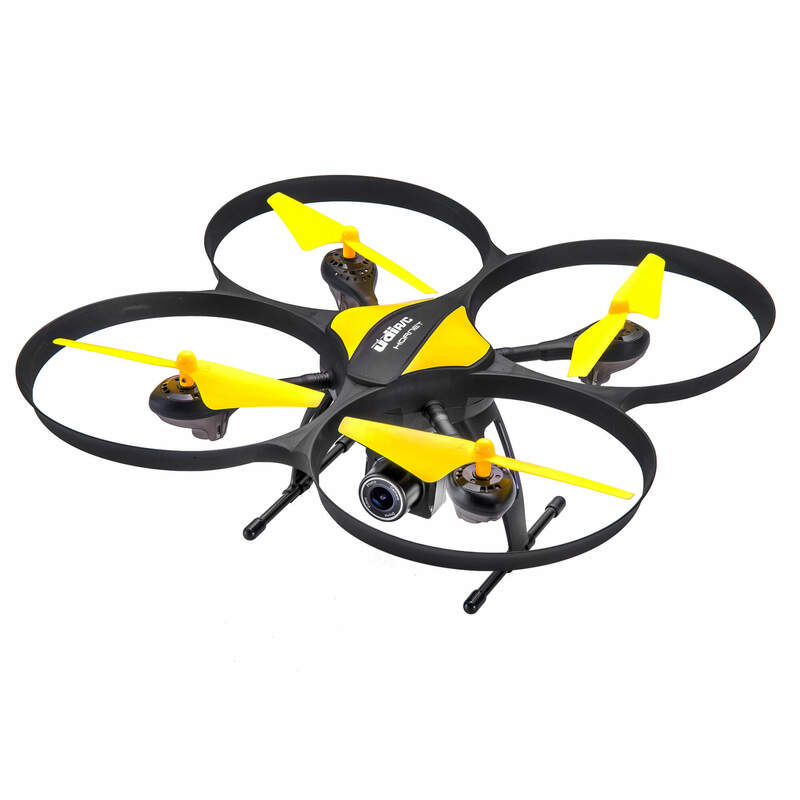 It has a very quick yaw and smooth controls that allow experienced drone enthusiasts to easily perform more exciting aerial feats. The AA108 also comes with a 720p HD camera that’s perfect for anyone who wants to start getting into aerial photography. In short, it’s the perfect choice for just about anyone – especially those who aren’t sure where to start in the vast and confusing world of quadcopters – because it offers a little bit of everything. The only people we can’t recommend it to are those who live in particularly windy areas, as the lightweight design and small body mean that it doesn’t do well in any kind of breeze. But then, that’s true of almost all mid-range hobby drones (certainly every entry on this list) and you can always fly it indoors. 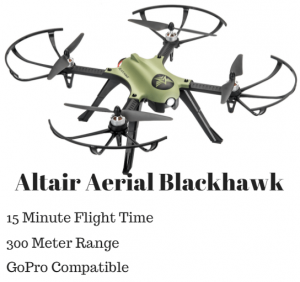 The Altair Aerial BlackHawk is another excellent drone with the same 15-minute flight time of the AA818 Plus. 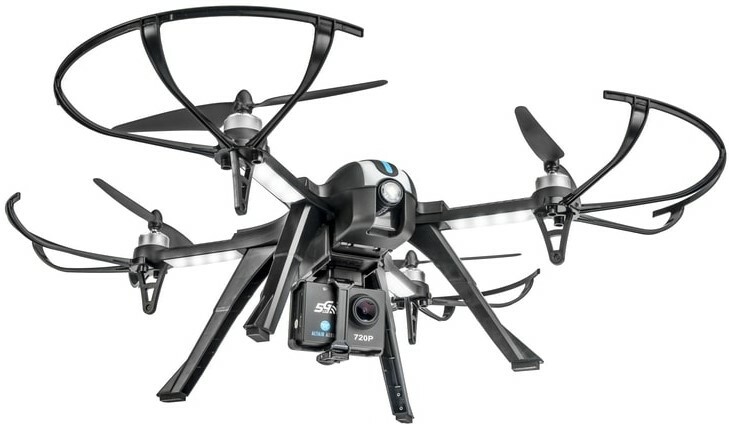 But it comes with a few other distinguishing features as well – most notably, the nearly-silent, brushless motors that make it ideal for taking video without the annoying hum of a loud drone engine. It’s also highly durable (much more than you would expect from the look of the prop guards), which makes it a good option for both indoor and outdoor shoots. That said, the BlackHawk is faster drone and can be harder to control, especially for beginners (since it doesn’t come with any kind of automatic hover function.) It does not come with a camera – instead, it has a mount that works with the GoPro Hero 3 or 4. Hard to fault that considering the number of features you get for $160, and the GoPro will definitely give you a better picture than the built-in cameras of the AA108 and similar. 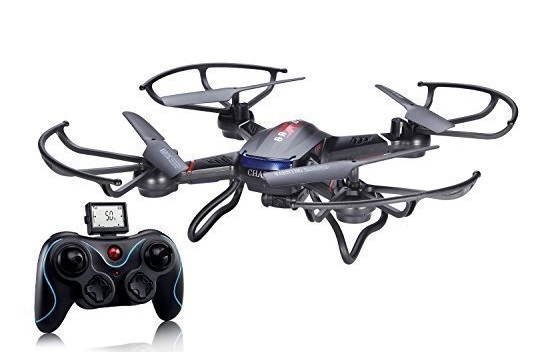 Still, this is a great quadcopter for any skill level, perfect for videography, photography, or even recreational use (the copy on the Amazon page recommends trying to scare people with the near-silent motors, an action Dronethusiast cannot condone even if it is hilarious.) If you don’t mind putting in a little extra money to buy the camera, this is a very high quality product that’s sure to please. For around 60 dollars more than the SYMA X5C, this has twice the memory, and a minute or two longer of flying time, for this reason we added it to our list of best hobby drones. The appearance is quite a bit different than the SYMA X5C: it is black and much thinner, whereas the SYMA X5C is much more circular. This model vaguely resembles a bee or fly, and is just a lot flatter overall. Reviewers from Amazon have stated that flipping the camera on before takeoff is the way to go, perhaps editing the video later if possible; this way you can focus just on the control of the drone while flying. The transmitter begins to beep loudly if the battery is running low, another great feature. One thing to think about with this model is that it is very lightweight. You may not have to register it because of this, and keep in mind that high winds can carry this device quite a distance. 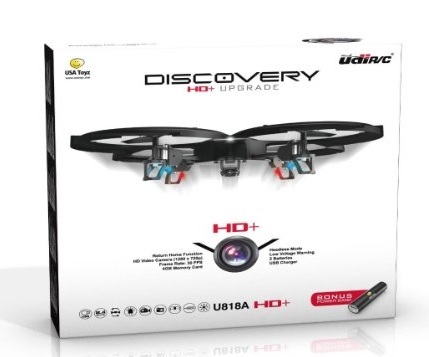 This model from Holy Stone is in the same price range as the UDI 818A, at right around $109.00. It has a bit of a sinister “Death Star” look to it, which some flyers will really enjoy. It has been said that the batteries can take around 3 hours to charge, but many flights get an extra two minutes or so longer in the air then the other two we reviewed so far. Many who are very into advanced-level flying still like this model, because when you strip it down and get rid of the prop guards, landing feet, and camera, it becomes much easier to maneuver. There are 4 speed rates, and some beginners to advanced have claimed that the 4th is definitely a bit difficult, but it can take quite a beating and still work well. For design, semi-mod-ability, and ease of use, this one is the favorite for many: the only downfall is that the camera has been known to malfunction every once in awhile. As part of our hunt for the best hobby drones out there, this Cheerson CX-10 is from the breed that is the most inexpensive, and this is going to absolutely take the cake with many users. 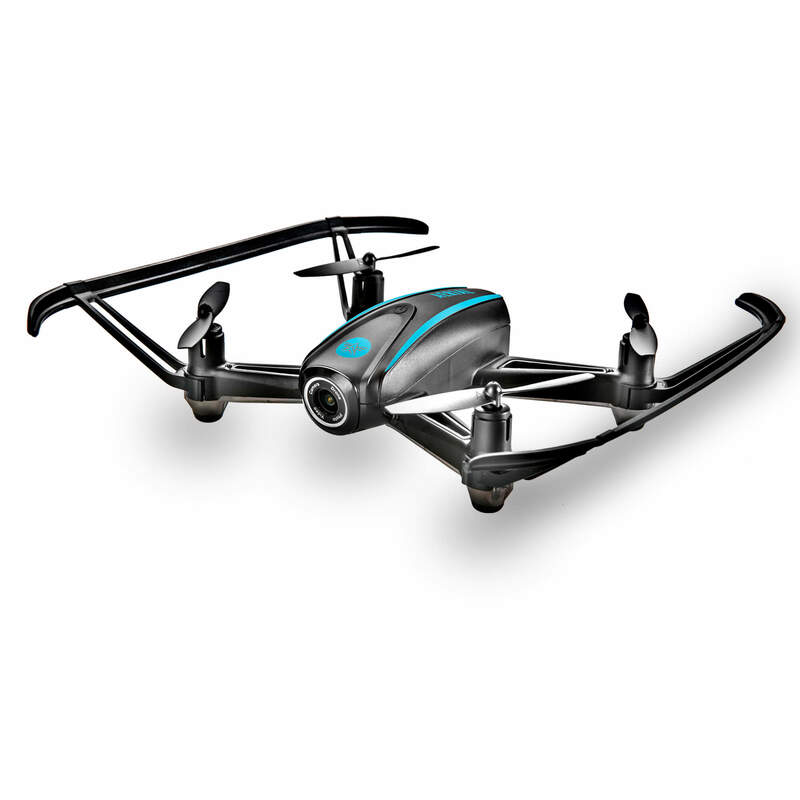 At only around $20, the sheer fact that it gets up in the air, flies around for about 8 minutes of battery life, and does in the meantime what other drones do, is amazing. The bright orange color is what many enthusiasts gravitate towards that are fans of paintball, hockey, and other very prime action sports; one recommendation on this model is that users purchase extra blades, and get the prop protector ring, that will save the propellers if you happen to crash. The charge time is quite a bit less then some of the others we reviewed, and the frame is a bit more delicate overall, but this one is so much fun it had to make our best hobby drones list. For a birthday present, gadget gift for someone that you don’t know if they will really take interest in fully, or present to the fellow geek in your entourage, this will take the cake. For the price, there simply isn’t many other options that can, figuratively speaking, “get off the ground”. These drones are the best hobby drones we could find online. If you have any comments or questions please add them below! Hi. Hoping you know how close the DJI Phantom 4 pro can get to abuilding before it halts or finds it way around..